guides, stats, and ways to counter strengths and expose her weaknesses! Play: In lane play safe. If your passive is ready, challenge your opponent, see how you stand against them and modify item build according to the opposition. Astrid’s role in a team fight is a disruptive bruiser, charge in after initiators do their thing. Make sure you have a partner when engaging, if alone and focused you won't last long. When targeted, wait for your HP to drop under 60% of max HP and use ultimate to soak up and deal damage. When Astrid’s HP falls below 80%, she gains a shield that absorbs 500 HP for 4 seconds. The shield effect has a 24-second cooldown and will be reactivated when Astrid takes damage again. Cooldown is reduced by 3 seconds every time Astrid hits an enemy hero with an ability or normal attack and by 1.5 seconds every time she hits an enemy minion or monster. -Excellent for engaging in one-vs-one battles and walking out relatively unharmed. Astrid swings her mighty sword around, dealing 200/240/280/320/360/400 (+120% of AD) physical damage to surrounding enemies. If she hits an enemy hero, Astrid’s attack speed will increase by 30/36/42/48/54/60% and an additional 5% for every other hero hit for 3 seconds. 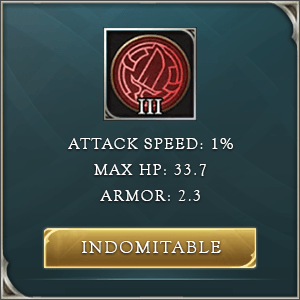 -Make sure you use the attack speed gained from this ability. Astrid charges forward, dealing 60/90/120/150/180/210 (+50% of AD) physical damage, slowing enemy movement speed by 50% for 1.5 seconds, and decreasing target armor by 30% for 4 seconds. Her next normal attack will be a critical hit and will reduce Fearless Charge’s cooldown by 1 second. This effect cannot stack. -It is a two-part skill. One is a charge, and the other is an attack after the charge. -Attack following this skill has an increased range and is basically an additional charge built into the attack. Armor and Movement reduction is built into the attack also. Astrid powers up and becomes immune to all damage for 1.5 seconds. After 1.5 seconds, she swings her sword, dealing 400/600/800 (+200% of AD) physical damage. If her current HP percentage is below 60%, the target is stunned for 1 second. If the target's current HP is below 60%, the target the target takes additional true damage equal to 16% of lost HP (up to 2000 for monsters). -The cooldown of Bladed Guardian is reset if an enemy hero is hit. -Excellent to use after being initiated upon, both for probably being low on health, for stunning the enemy, and for damage prevention (especially worth it if you soak some important opposing cooldown). -Landing this ultimate properly requires a certain amount of good positioning. -Good combination of defensive tools. Passive combined with ultimate's immunity can provide Astrid with enough time to do her job, which is to soak up some and deal tons of damage. -Great front-line AoE damage. Aside from Fearless Charge, all other skills are AoE damage, combined with Leviathan (if she is a jungler) and Mantle of Ra, makes Astrid a great frontline warrior who rushes in the center of the battle. -Added bonus effects on skills. 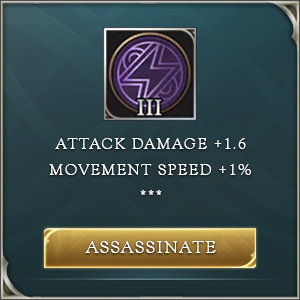 Increasing attack speed with Spin Slash, decreasing movement speed and armor with Fearless Charge, stunning those with more HP with Dire Blow. -Susceptible to kiting. Astrid has just one gap closer and if she gets knocked back or hard cc'ed outside of her range, it will be a lot very hard getting back into the thick of things. -Too weak when behind in farm. Astrid's role is to charge in, and she needs a lot of farm if she is to soak all that damage and survive to dish out her own. then continue as usual. Mantle of Ra >Gilded Greaves and so on. (The reason for this is January 2019 patch change and ability to acquire stacked layers of passive Wild are recorded. After purchasing level 2 or level 3 jungling equipment, the buff corresponding to stacked layers will be received). Lane as AoV Astrid: In lane play safely, you can’t afford to lose trades. Stay behind if your foe is stronger than you. After you complete some of the major items, like Mantle of Ra, test it out and challenge your opponent, see how you stand against them and modify item build accordingly. Take boots that help you against that opponent specifically. Subsidize your lane time with near jungle monsters when you have time, for example, if you pushed minions away from the tower and you think there is enough time to do that. AoV Astrid Team fights: Astrid’s role in a team fight is a disruptive bruiser, charging in after initiators do their thing. Make sure you have a partner when engaging, if alone and focused you won't last long. When targeted and below 60% HP, use ultimate to soak up and deal damage. Because you don’t have hard cc, it is better to focus on taking enemy squishies out, than protecting your own.